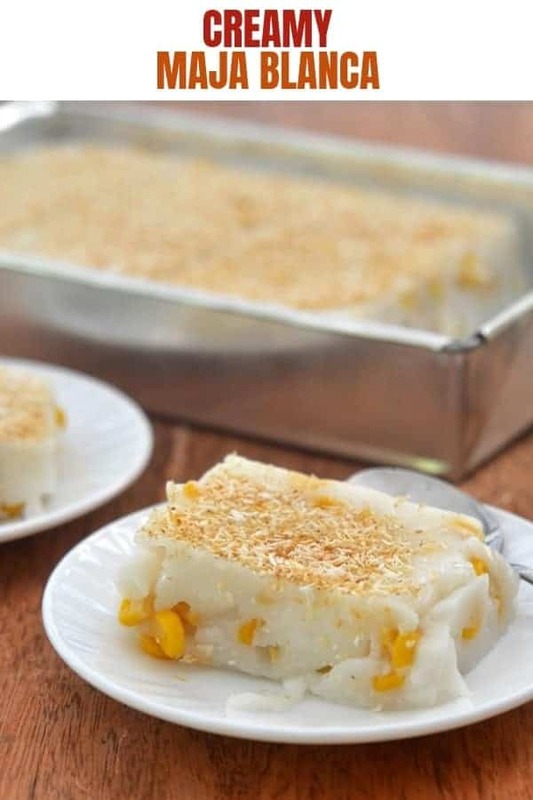 Maja Blanca made with coconut milk, sweet corn kernels, and toasted coconut. 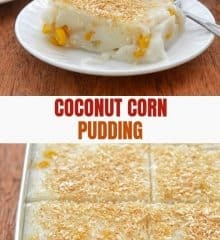 Rich and creamy, this coconut pudding makes a delicious snack or dessert. And just like that, my three-week vacation is over. I got back to the U.S. last night exhausted from the long flight but very much inspired and excited to get back to the swing of things. This recent trip to the Philippines was fruitful. Not only did I have a wonderful time with my mom, daughter, and extended family, but I was also able to work on a bunch of native cake recipes with a skilled magkakanin in our hometown and learn a few essential photography tricks from my fellow food bloggers, Bebs and Armin. This maja blanca was one of my earliest recipes on the blog, first posted in 2013. 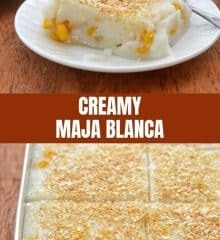 It’s a more straightforward version of our classic Filipino coconut pudding, with fewer ingredients and easier steps than the maja blanca espesyal and maja de ube I also have on the blog. 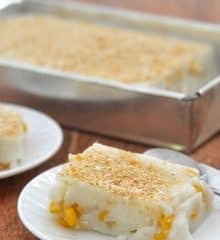 While the latter two include evaporated milk and condensed milk, the pudding base for this simple maja blanca is a basic mixture of coconut milk, cornstarch, sugar, and corn kernels. 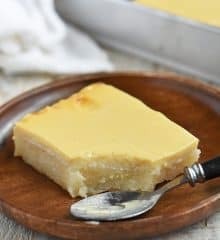 Instead of a golden latik topping which can be a bit time-consuming to cook, it’s garnished with toasted coconut flakes which take but a minute or two to make. However unpretentious, it is, nevertheless, luscious and tasty in its own right and makes a great snack or merienda everyone will love! To keep the coconut milk from curdling and separating, do not allow to come to a rapid boil. 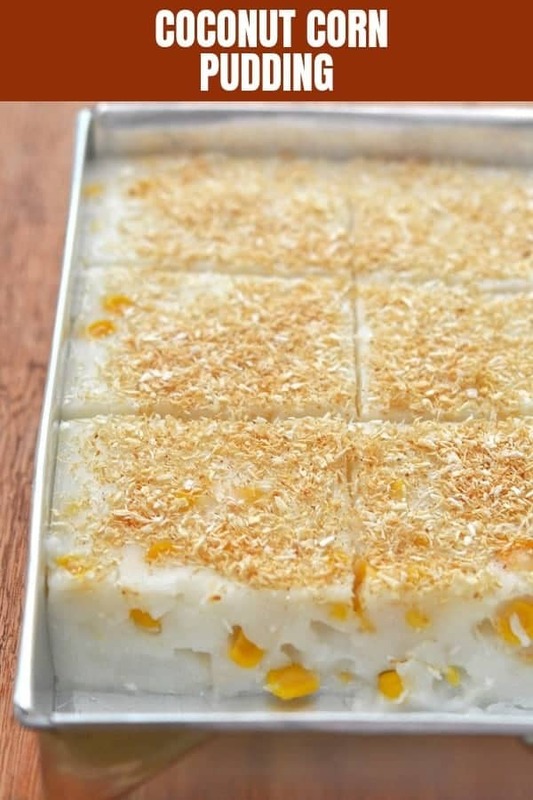 For a richer, creamier texture, use kakang gata or first coconut extraction. To add more corn flavor, use the packing liquid from the can in place of water in equal amounts to dissolve the cornstarch. Remove the toasted coconut flakes from the heat a shade lighter as they’d continue to cook and brown in the residual heat. I used a tin 9 x 6-inch baking dish but an 8 x 8 should work as well. Looking for delicious holiday treats? Check out a list of my favorites below and stay tuned the rest of the month as I have special kakanin such as tibok-tibok, kalamay gabi, kapit, and maja pandan coming your way soon! 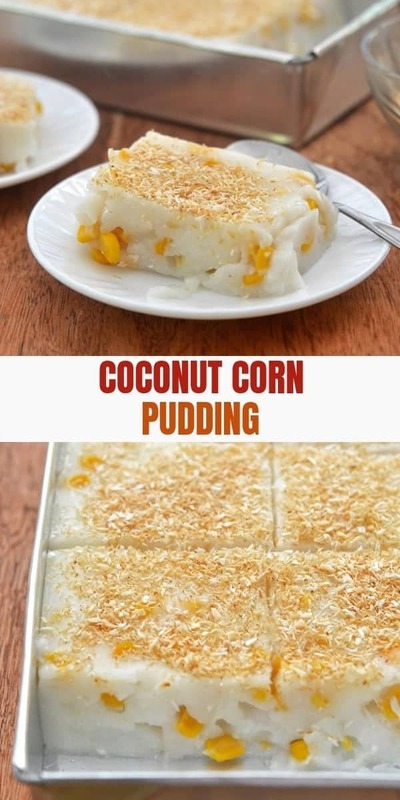 In a saucepan, combine coconut milk, corn, and sugar. Over medium heat, bring to a simmer, stirring occasionally until sugar is dissolved. In a small bowl, mix cornstarch and cold water until completely smooth. Slowly add to coconut milk, whisking vigorously to prevent lumps. Continue to cook, whisking regularly, for about 2 to 4 minutes or until mixture thickens to a smooth paste consistency. In a lightly greased 8 x 8 baking dish, transfer thickened coconut mixture. Using a spatula, smooth surface. Allow pudding to cool for a few minutes. Cover and refrigerate for about 1 to 2 hours or until completely set. In an ungreased skillet over medium heat, toast shredded coconut, stirring frequently, for about 1 to 2 minutes or until golden brown. Remove from heat immediately. 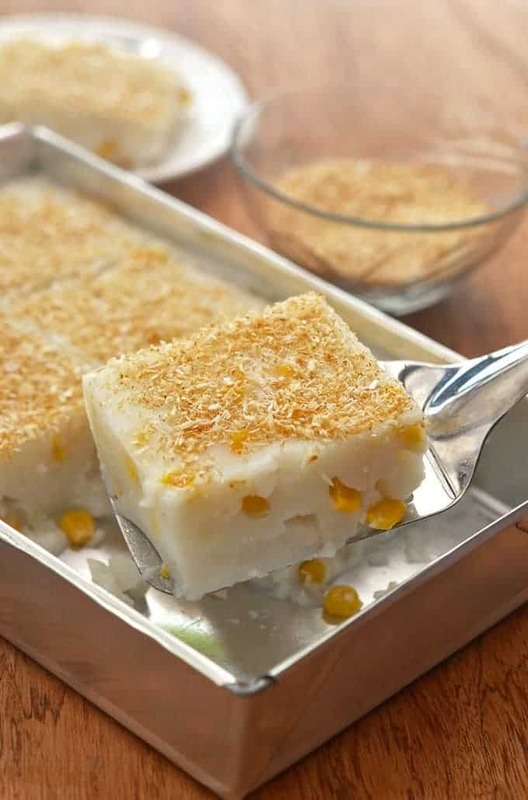 To serve maja blanca, sprinkle toasted coconut flakes on top and cut into squares. 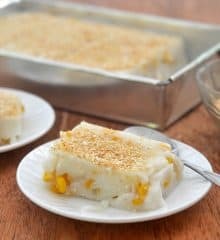 If the addition of corn is desired, add 1/2 cup canned sweet corn kernels together with coconut milk and sugar when boiling. 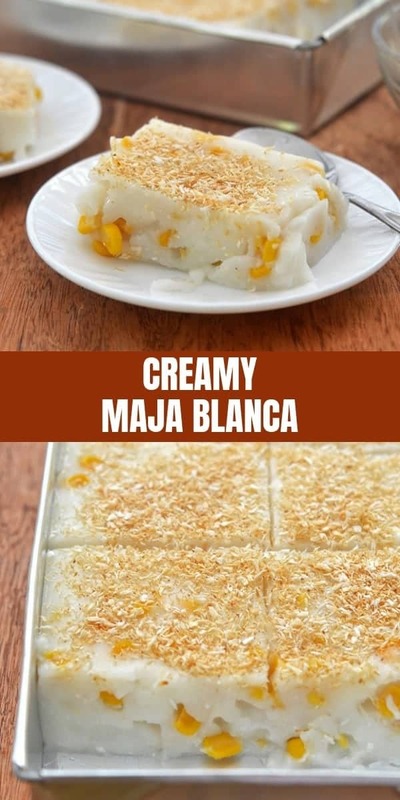 I am glad the maja blanca was a success. 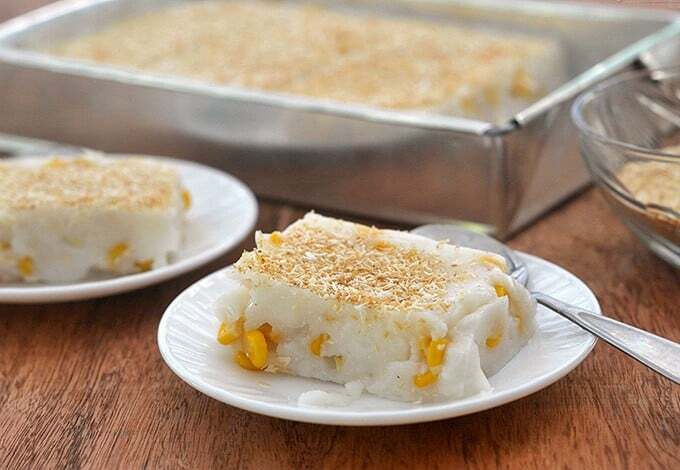 But you need to try this next time with latik, makes a big difference! 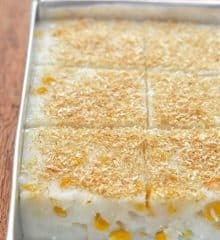 If you don’t have coconut cream (kakang gata), you can use coconut milk. 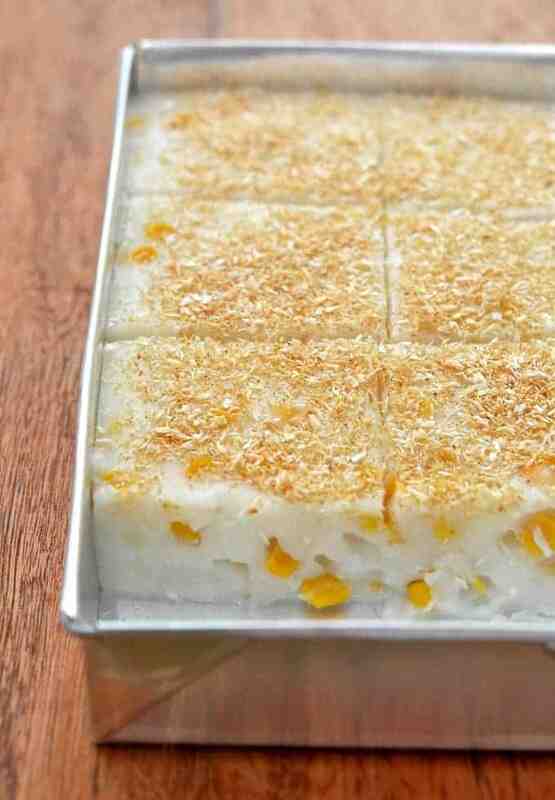 It will just take a little longer to make the latik as it has higher water content.